Like symbiotic species, a galaxy and its central black hole lead intimately connected lives. The details of this relationship still pose many puzzles for astronomers. Some black holes actively accrete matter. Part of this material does not fall into the black hole but is ejected in a narrow stream of particles, traveling at nearly the speed of light. When the stream slows down, it creates a tenuous bubble that can engulf the entire galaxy. Invisible to optical telescopes, the bubble is very prominent at low radio frequencies. The new International LOFAR Telescope - designed and built by ASTRON in an international collaboration - is ideally suited to detect this low frequency emission. Fig. 1: This false colour image shows the galaxy M87. 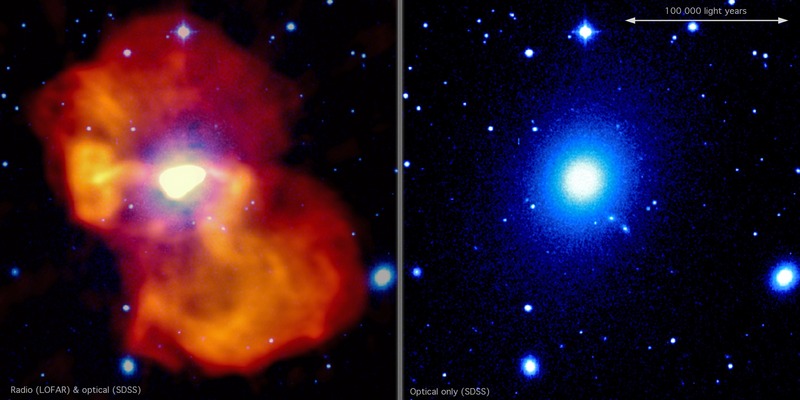 Optical light is shown in white/blue (SDSS), the radio emission in yellow/orange (LOFAR). At the centre, the radio emission has a very high surface brightness, showing where the jet powered by the supermassive black hole is located. Fig. 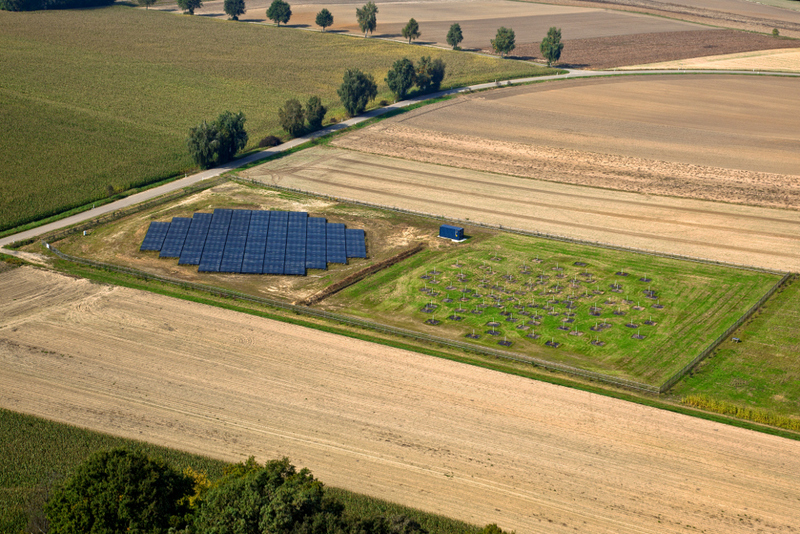 2: The LOFAR antenna array near Unterweilenbach is operated by the MPA. It is one of the 6 stations in Germany and 40 stations in the Netherlands that are combined to study the largely unexplored frequency range between 10 and 240 MHz. Astronomers have produced one of the best images ever of such a bubble, using LOFAR to detect frequencies from 20 to 160 MHz. "The result is of great importance", says Francesco de Gasperin, lead author of the study that will be published in the journal Astronomy & Astrophysics. "It shows the enormous potential of LOFAR, and provides compelling evidence of the close ties between black hole, host galaxy, and their surroundings." “This is the first time such high-quality images are possible at these low frequencies", says professor Heino Falcke, from Radboud University, Nijmegen, and MPIfR Bonn, chairman of the board of the ILT and co-author of the study. "This was a challenging observation - we did not expect to get such fantastic results so early in the commissioning phase of LOFAR." "What is particularly fascinating", says Andrea Merloni from the Max-Planck Institute of Extraterrestrial Physics in Garching, who supervised de Gasperin's doctoral work, "is that the results also provide clues on the violent matter-to-energy conversion that occurs very close to the black hole. In this case the black hole is particularly efficient in accelerating the jet, and much less effective in producing visible emission." LOFAR, designed and built by ASTRON, is a revolutionary instrument able to detect radio waves with wavelenghts up to 30-meter. Radio waves this long are typically generated by human activities as radio broadcasts, radar signals or satellite communications. They are also emitted by exotic objects in deep-space, such as accreting black holes, rotating neutron stars and supernovae. To detect these waves, LOFAR uses thousands of antennas spread all over Europe and combines the signals in a supercomputer located in the Netherlands. The 100 Gigabit per second of data flowing from all antennas are analyzed simultaneously and in real-time to provide the most detailed images ever done at these frequencies. International LOFAR Telescope operations are coordinated by ASTRON, the Netherlands Institute for Radio Astronomy, on behalf of a consortium consisting of the Netherlands, Germany, France, the UK, and Sweden. Many of the technological solutions developed for LOFAR, in particular the calibration of phased-arrays as well as large-scale data transport and processing, will be highly relevant for future radio telescope projects such as the Square Kilometer Array (SKA).